Its here again! This October we are reserving time to take off our treatment gloves, upright the dental chairs’, put down our hand pieces and open our doors to our patients and specialist team to celebrate and give thanks. 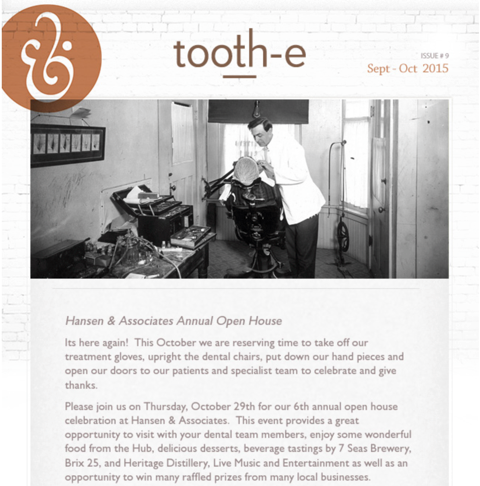 Please join us on Thursday, October 29th for our 6th annual open house celebration at Hansen & Associates. This event provides a great opportunity to visit with your dental team members, enjoy some wonderful food from the Hub, delicious desserts, beverage tastings by 7 Seas Brewery, Brix 25, and Heritage Distillery, Live Music and Entertainment as well as an opportunity to win many raffled prizes from many local businesses. Feel free to come alone, or bring your friends and family, the more the merrier! Doors open at 4:00 PM, till 6:30. We look forward to seeing all your smiling faces! Do Your Kids Need Mouth-guards for Sports? Baxter Hershman, a sophomore at Gig Harbor High School, is the new western Washington student representative to the Washington State Board of Education. Hershman’s appointment is the result of a competitive application process that culminated with panel interviews of potential candidates conducted by students from the Washington Student Advisory Council (WASC). Hershman has always had an interest in public service and is happy to be a part of the Board as voice and serving students in Washington State.